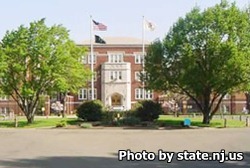 Albert C. Wagner Youth Correctional Facility is located in Bordentown New Jersey, part of Burlington County. It is a mixed custody prison for youthful offenders, and has a minimum custody unit, a medium security unit and a close custody unit for administrative segregation and maximum security inmates. The current capacity of this facility is approximately 1,250 inmates. Offenders at Albert C. Wagner Youth Correctional Facility can receive individual and group counseling, substance abuse and mental health treatment. Additionally, educational and vocational programs teach the inmates new skills while they serve their sentence. Inmates can work in a metal fabrication shop for the Bureau of State Industries. Visitation is for approved visitors only. Visiting occurs on Saturdays and Sundays from 7:30am-9:45am and from 11:15am-1:30pm. Registration times are from 6:15am-7:15am for the morning visit and from 10am-11am for the second visiting session.